Like the famous ketchup company, Whaler used to make boats in nearly 57 varieties. Since this is the 57th page of the CETACEA collection, let's go for a little variety here, too. "I know in the past there have been quite a few posts about converting an old 13-Whaler steering from wire rope and pulley to Teleflex cable. I came across some pictures I had taken that show the Teleflex stand-off bracket installation that is needed with the notched transom. I thought they might come in handy for the web site. 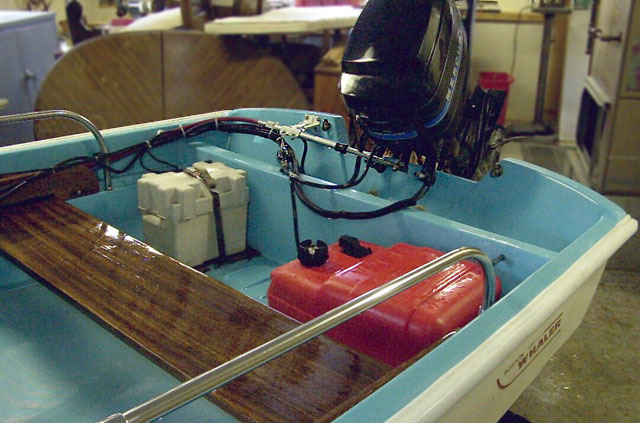 "The boat is a 1971 and the motor is a c.1981 Mercury 40-HP short shaft. 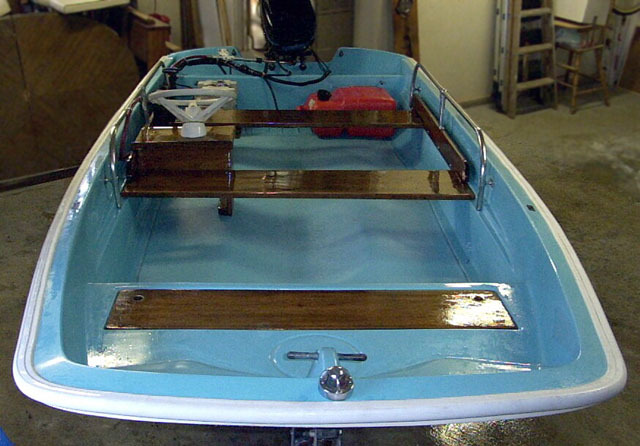 I had a lot of help from the forum refinishing the boat last year. My favorite addition/alteration to the boat was the replacement of the original one-piece white rub rail with a new 3-piece replacement from the 1998 Anniversary Edition 13-Sport." Shot indoors and with available light, the gelcoat still gleams and the fresh varnish still shines on this 1971 Whaler 13-Sport restored by Dan Harden. This must be one of the last boats made before the c.1972 change in hull molds. After c.1972, prominent alterations were made by Whaler to the bow (the "smirk") and motor well (curved well). The original steering was accomplished with wire rope and pulleys. Refitting more modern cable steering requires the use of this specal stand-off bracket. The original rub rail was white and glued in place. Forty years later a replacement part became available with the introduction of the "Anniversary" model. This rub rail mechanically fastens to the hull and can be much more easily replaced if damaged than the original style. "I just discovered your web site after my husband and I decided to sell our Whaler--now we think we might hold onto it! It's been in the family since new, and VERY WELL maintained, especially the mahogany console and pilot seat (my husband runs a millwork shop in the Baltimore area). I didn't see any recent pictures of this model on your web site, so I thought I'd send you one. We have other pictures if your interested in seeing them. 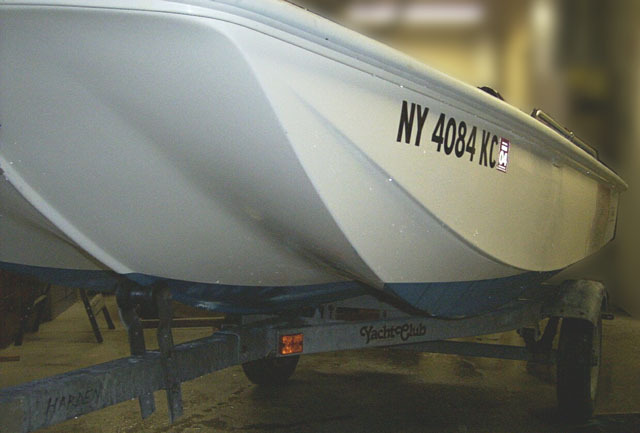 IF we decide to sell, we'd love to sell it to someone with a great appreciation of the Boston Whaler and would like to find out what the value is in our area. 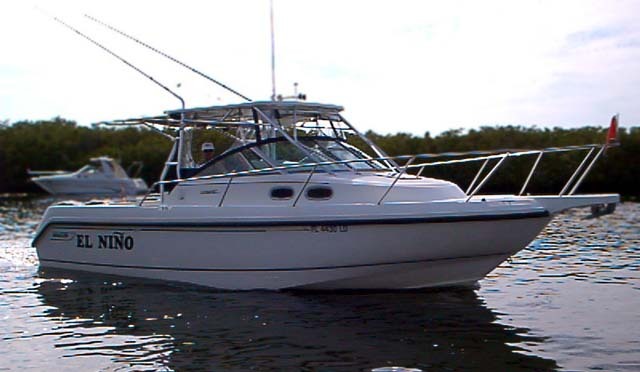 We just purchased a 25' Grady White and enjoy fishing and crabbing on and around the Chesapeake Bay. Should we hold onto this beauty?" This very nice 17-Sakonnet dates from 1975, near the end of production for this model. 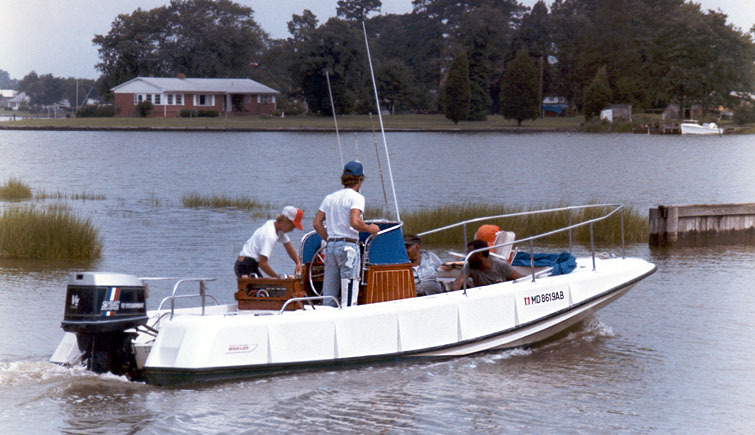 Boston Whaler changed from elaborate mahogany wooden consoles to molded ones that need a bit less intensive car to maintain. This original one looks to be in perfect condition, proving that even a quarter-century is no challenge for well-cared-for wood components. "I thought you would enjoy this photo of my Boston Whaler 1972 Outrage-21. I bought it used in 1973 for $5,000. I changed the forward platform to a teak grating and added a fighting chair on a pedestal. The boat was named WIDGEON and had a duck painted on the teak console door. All the teak was original and varnished with 12 coats of Interlux-90. I had to sell the boat in the early 1990's when my oldest started college. At the time it was based in Coltons Point, MD. Does anyone know where this boat is now? "Since then I have had the good fortune to acquire my dream boat, a 31-foot Flybridge Bertram, but during inshore rockfishing season, I still miss my 21-foot Whaler. My 13-footer is just too small sometimes, although it did okay at Nauset Inlet last fall. Nice site, keep up the good work." Have You Seen This Whaler? 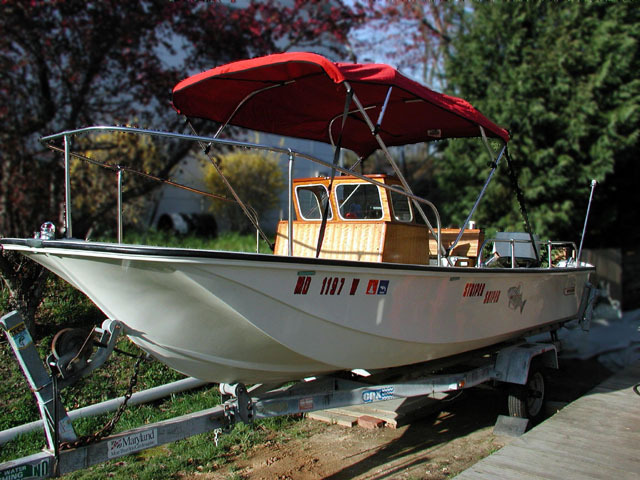 With the rare ribbed hull sides and unusual large diameter destroyer wheel, this 1972 Boston Whaler 21-Outrage should not be too hard to spot. Its former owner is curious where it might be now. I wonder if that 235-HP Evinrude is still on the transom? Tom Birdsey added another Whaler to his collection, dashing from upstate New York to Saugatuk, Michigan this spring to complete the purchase of a very nice 21-Outrage with ribbed sides, exactly the Classic Whaler he had been searching for. I think southwest Michigan must be like that military air base in the desert where they keep old warplanes in standby. There seems to be no limit to the number of fine old hulls that can be found here. The thirty year old boat was in good shape. With a new trailer underneath her, she made the haul by highway back to New York without problems. More refitting and restoration is planned. If you come to Michigan in April to buy a boat, don't count on the 85-degree weather we had the week Tom Birdsey bought this old beauty. The classic Whaler bow "smirk" and the "outrageous" sheer line of this ribbed side early 21-Outrage leave no doubt this was one of Whaler's finest hulls. Those marks on the bow are about the only imperfections in this thirty year old gelcoat. Tom, his dad, and his son, all seem to be enjoying the ride in Grand Traverse Bay. Like all trailerable boats, the 21-Outrage seems to double in size once you get it on the trailer. The total rig is approaching 45-feet in length. It tows well behind the Ford Expedition on a new Karavan tandem axle trailer. Not every reader of continuousWave has a trailerable Whaler. Burnt Store Isles Boat Club members Eric and Miriam Muñoz of Punta Gorda cruise the western coast of Florida in their 28-CONQUEST, EL NIÑO. When a Whaler grows to this size, it is usually not kept on a trailer. More than the weight, a beam wider than than 96-inches makes highway movement of the boat a problem requiring special permits in most states. 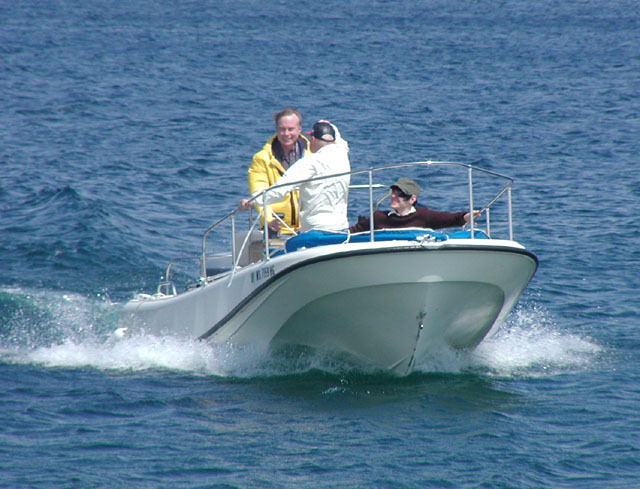 The 28-CONQUEST is Whaler's largest outboard powered model. The large cabin provides comfortable overnight accommodations. This letter from a young Canadian boater underscores why so many parents prefer their youngsters to use a Whaler for their on-water activities. "My name is Jean-Sèbastien Grisè and I come from Montreal (Canada). I own a 13-DAUNTLESS 1998. I received it for my 13th birthday from my father. Last summer, it saved my life. 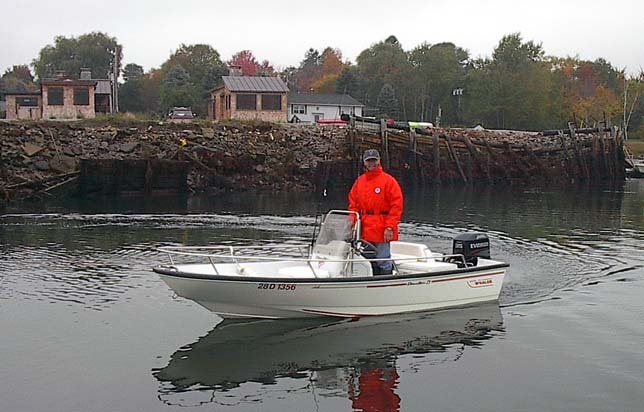 "My whaler is powered by a 35-HP Evinrude (will be changed for a 50-HP 4-Stroke Big Foot). This spring, I project to put a sound system on my boat. "This picture [was taken] in Kennebunkport, Maine, last summer, where I went to go fish Stripers. My dream is to own a 23-Outrage when I am older. Whalers are the best boat in the world. I haven't found a name for my boat. "It's an honor for me if you can add my picture to your Cetacea web page. "Thanks a lot for your email. Your website is very interesting! For the moment, I don't have any picture of my 13-DAUNTLESS and me. But this spring, I'll manage to take some and send them to you. Unfortunately, last summer, I didn't sail a lot in my Whaler because it was on reparation for a month. "It was a nice Thursday afternoon. I sailed a mile away from the channel to pickup some mackrel (bait). But when I tried to come back to the channel, my engine shut down and wouldn't start again! I was trying, but it just wasn't reacting! A little while after, the wind pushed us on the rocks. "After we got towed out of the water, I took a look at my boat and saw all the scratches. I was quite impressed and I am still every time these terrible pictures are going through my mind. "Back in Montreal, we opened the engine and found out that the pushing rods from the gas control were disconnected. Some missing locks caused the problem. Now, everything is repaired and I am getting ready to go back sailing as soon as the weather is clement enough." "That's a part of the reasons why we will change that engine. That's not quite 57, but five varieties of Whaler for this installment of CETACEA. The page has been accessed 57378 times. This article first appeared April 30, 2002.